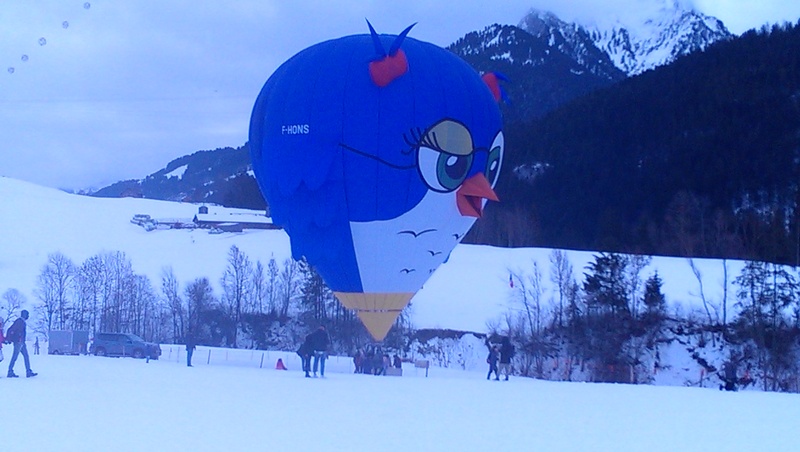 We went to the Chateau d’Oex Hot Air Balloon Festival! I think we can all agree that there’s nothing better than a hot air balloon festival. What a sight to behold, dozens of massive, colorful, and often whimsical balloons lifting off together into a clear azure sky. 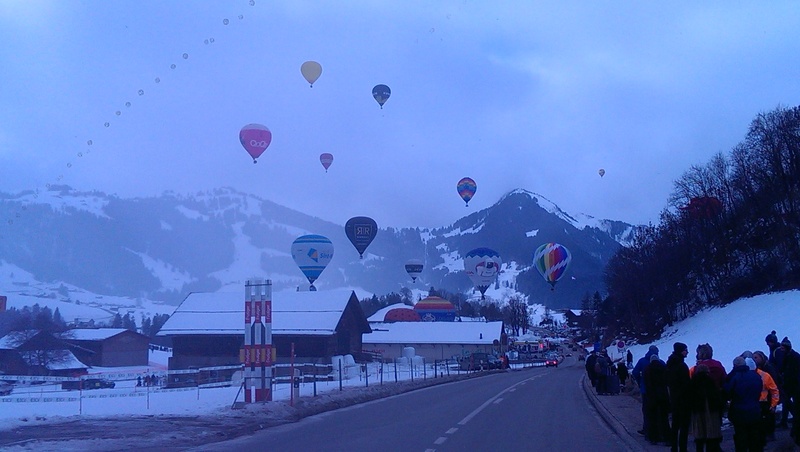 So when I learned that the village of Chareau d’Oex, the Hot Air Ballooning Capital of the World, would be hosting its annual “International Festival des Ballons à Air Chaud”, I made plans for us to spend that weekend in the Swiss alps. The village of Chateau d’Oex (pronounced “Chateau Day”, sort of…) is a two-hour drive from Geneva up into the Swiss alps. The second half the trip is a steady, winding, uphill climb from the floor of the Sion valley toward the well-known ski town of Gstaad, with its majestic mountain peak views. On the day we drove up, the sky wasn’t exactly azure, but the weather conditions were otherwise perfect: chilly, with a light snowfall and very little wind. We arrived just as a dozen or more balloons were launching. After we’d been there for a little while, the weather brightened to reveal a partially cloudy but otherwise azure sky. This colorful balloon sports the logo of the festival. That one on the right is supposed to be a cylinder of compressed gas, essential for successful hot air ballooning. For a reasonable price, you could go for a ride in a tethered balloon, shown below. I’ve never gone for a ride in one, but I’ve concluded anyway that it’s just as much fun to walk around looking at them as it is to float up in one. Look! Up in the sky! It’s a bird… It’s a plane… No, it IS a bird! 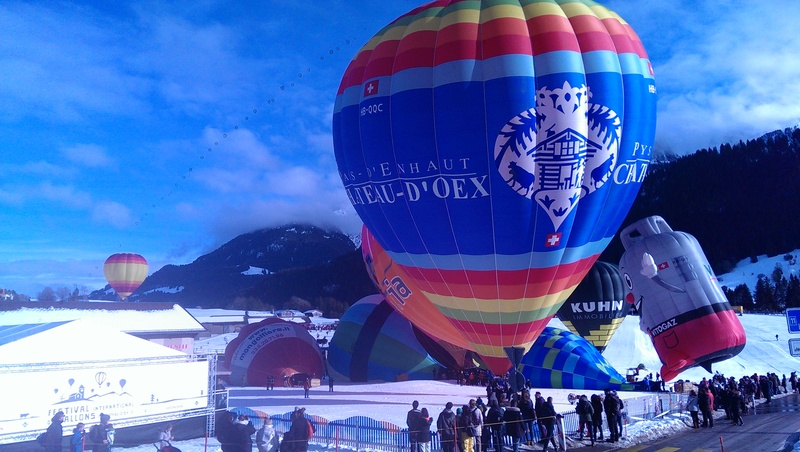 I know what your’re thinking: “Why is this international balloon festival held in a little Swiss village high in the alps?” As it turns out, Chateau d’Oex has a proud ballooning history: it was the launching point of the first ’round the world’ voyage of a hot air balloon. In 1999, a Swiss pilot named Bertrand Piccard and an English pilot named Brian Jones circumnavigated the globe in 15 days. Since they reached altitudes of 35,000 feet, they opted out of the traditional wicker basket, and flew instead in this iron capsule, which is displayed just outside the Hot Air Balloon Museum. We were at the festival’s 20th anniversary celebration of the flight around the world. Here’s a short video I shot to capture the sights and sounds of this festival. The narration is in French. I think he was mentioning something about how lovely the balloons look against the azure sky. I love cross country skiing. And for the record, I don’t like downhill skiing. It’s too scary. I enjoy the serenity of cross country skiing. So this winter, for three main reasons, I’ve been working hard to get my kilometers in. Reason #1: This is our last winter in Switzerland. (Yes, the SwissSojourner’s remaining days in Switzerland are numbered. More on that another time.) 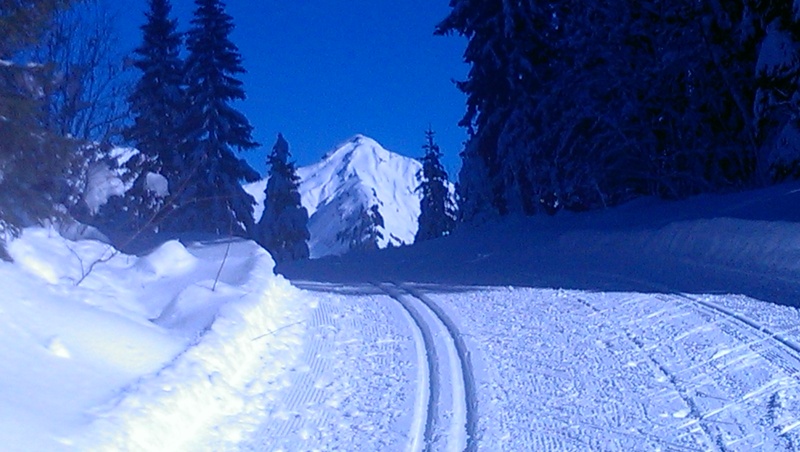 Reason #2) It’s been a great winter for cross-country skiing in the nearby Jura and the French Alps. 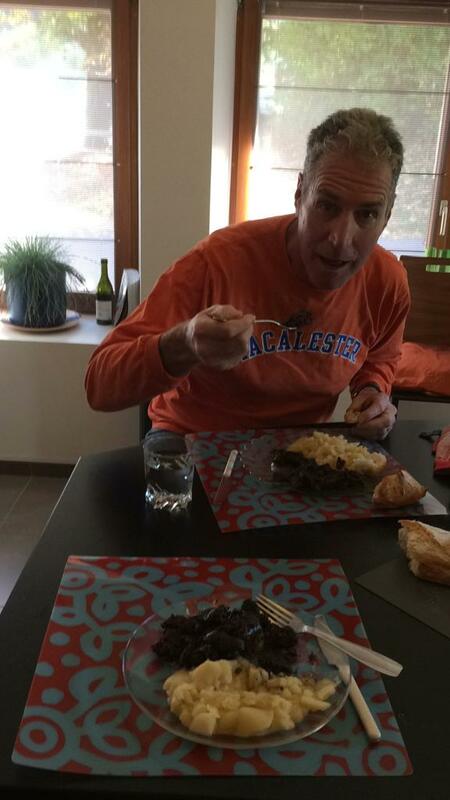 Reason #3: Our good friends Ed and Mary came to visit for a ski vacation! So I’ve had plenty of motivation to get out and ski this winter. Our “go-to” destination for cross country skiing is the Jura National Park, just 45 minutes away near the town of St. Cergue, Switzerland. (Only a stone’s throw from France, though.) The Jura mountain range follows the France-Swiss border from Geneva and extends northward all the way to the Alsace region. 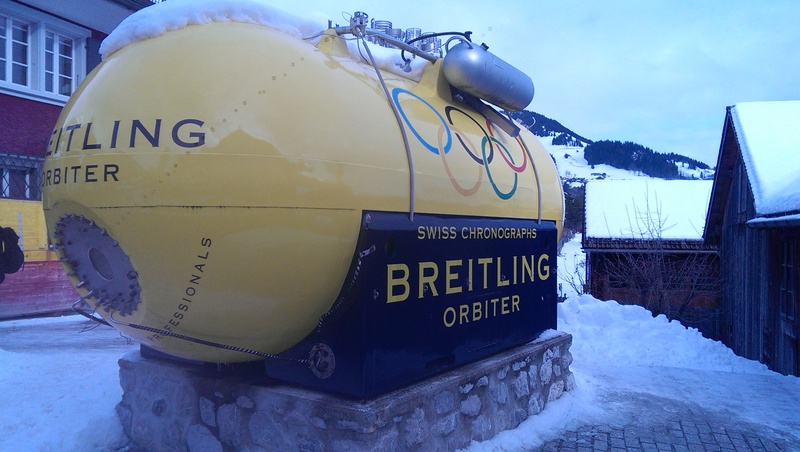 Within an hour’s drive from Geneva, there are several great skiing options. And the drive is part of the fun! At just 1500 feet above sea level, there is no snow in Geneva. You have to drive “up” to get to the snow. In this video, which I produced with two hands firmly on the wheel, you can get a feel for the drive up to the crest of the mountain range, at around 4,000 feet above sea level. 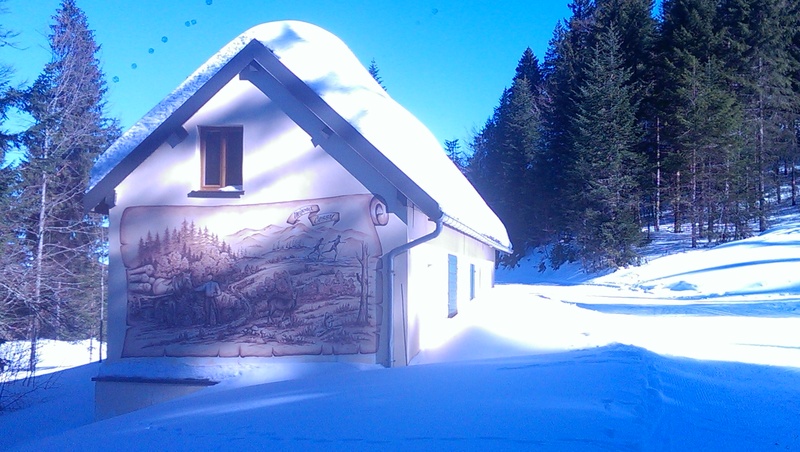 Our newest favorite place to ski in the Jura is a placed called La Vattay. What I love most about La Vattay is that the area is dedicated exclusively for cross country skiing. What I love second most is that there are over 50 kilometers of beautifully groomed ski trails. What I love third most is the friends you make out on the trail. Cross-country skiers are almost always fun and friendly people. Another thing about the skiers over here. They start them very young. I see this scene a lot, and it always makes me smile. 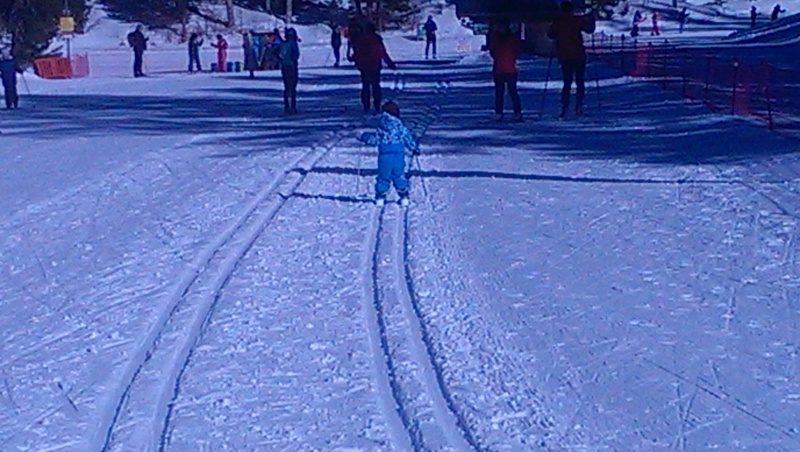 This future Olympian might be 3 years old. Maybe. The trails at La Vattay are mostly through the woods, which is nice especially on a colder or windier day. Here’s a look from the trail. I made this video for Ed and Mary before their visit to pump them up! Then Ed and Mary came! (Interesting note: Ed and Mary also happened to be our first ever visitors, and as it happens, they will also be our last. Like bookends.) Our first ski together was at a place on the Jura crest called Col de Marchailluz. Top 3 on the podium! 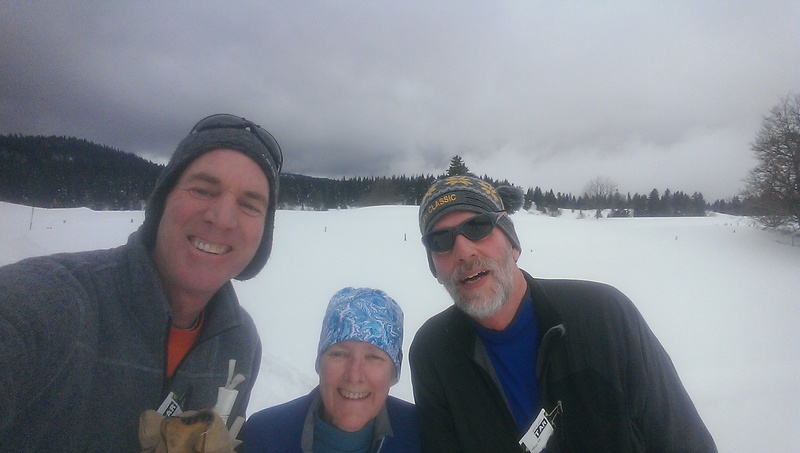 …and here are Ed and Mary skiing in at the end of our 18 kilometer ski. Another great place to cross-country ski is Chamonix, in France. So the next day we headed south from Geneva about an hour and fifteen minutes to ski the along the Chamonix Valley, in the shadow of Mont Blanc, Europe’s tallest mountain. The ski trail is mostly flat, except for more challenging part that Ed did, and runs along the beautiful Arve River. We came upon these blonde horses in a barn out on the trail. 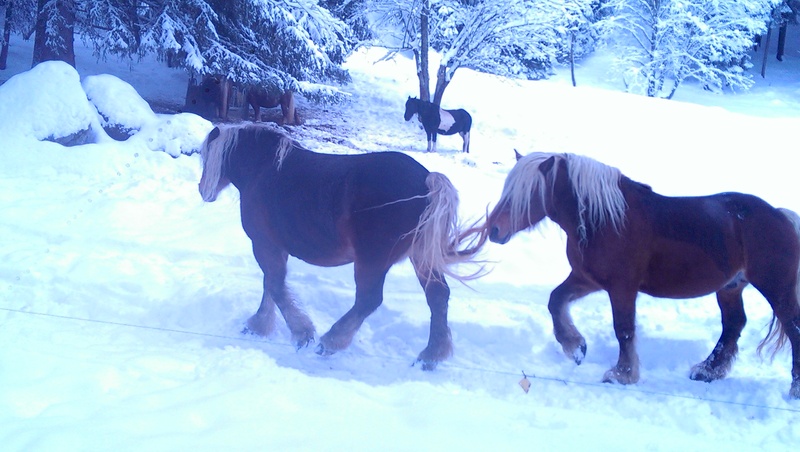 I watched one of these horses take a “snow bath” rolling around in the snow! Ed and Mary sandwiched Spain inside their Swiss vacation, so for the week they were gone, I did a little scouting on my own of a ski town in the French alps called Morzine. Morzine is known more for its downhill skiing, but there are some good cross-country trails too. I rode up to the top on a chairlift, clipped into my skis, and skied along the mountain ridge with some beautiful vistas, like this one. A magnificent view from the trail in Morzine. The day after Ed and Mary returned from Spain, we ventured back up the Jura to ski the red trail at La Vattay. Here’s a map of the trail network. Maybe if you click on it, that’ll enlarge it enough to be able to make out the different colors of the trails. The red trail route we completed was 11 kilometers. I told Mary I was going to come back and do the black trail. On Mary and Ed’s final skiing day, we set out early for the winding drive all the way up to the Morzine/Avoriaz area, about 90 minutes away. But fate intervened, and an incoming storm on the top of the mountain forced us to create a new plan, one that did not involve getting stuck in a blizzard at 6000 feet in the French Alps. Instead, I called our friends Philippe and Linda in Lullin, 30 minutes away along the scenic Routes des Alps where they invited us over and welcomed us with their customary great hospitality and the world’s greatest ice cream. Ed and Mary left the next day, but I wasn’t done. I pledged that I would come back and do the black trail at La Vattay. (Refer to indecipherable map, above.) So I did. It’s called the black trail, but it doesn’t carry the same connotation as a downhill “black diamond” trail. It’s not more dangerous, it’s just more challenging. Longer uphills mostly. It does contain downhills too, of course, but my snowplowing skills are pretty advanced these days, so I succeeded in not wiping out. Here’s a photo I took of the trail marker that indicates the kilometers covered and the overall elevation change over the trail course. 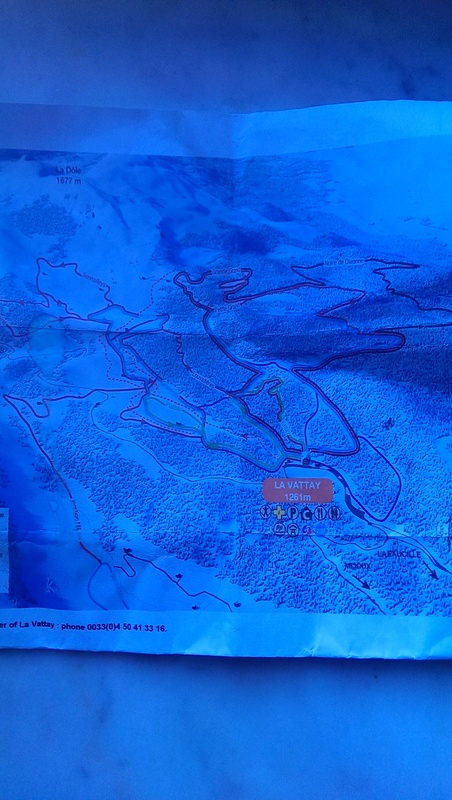 This map of the black course shows an elevation change of a couple hundred meters along the 18K course. Its always more fun to ski with other people, but this solo ski was one of the best I’ve ever had. 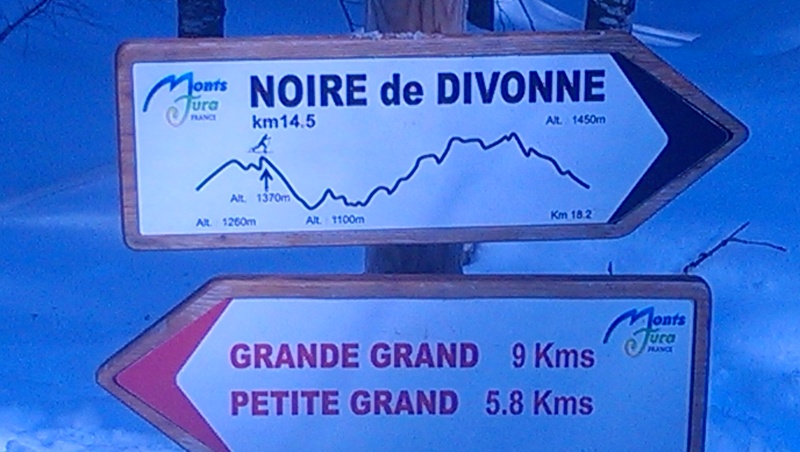 I even felt good enough to add on a bit of the red trail, so I completed around 25 kilometers in a 3 hour ski. I stopped periodically to rest, or chat with fellow skiers or to take in some sights. Here is a picture of something really cool that I stumbled upon way out on the black trail. I wonder who the artist is! Look at this awesome mural! As I mentioned, this is our last winter here. I think we have another 4 or 5 weeks of good snow left. I plan to make the most of it. I’ve made some good friends hiking up Le Salève! 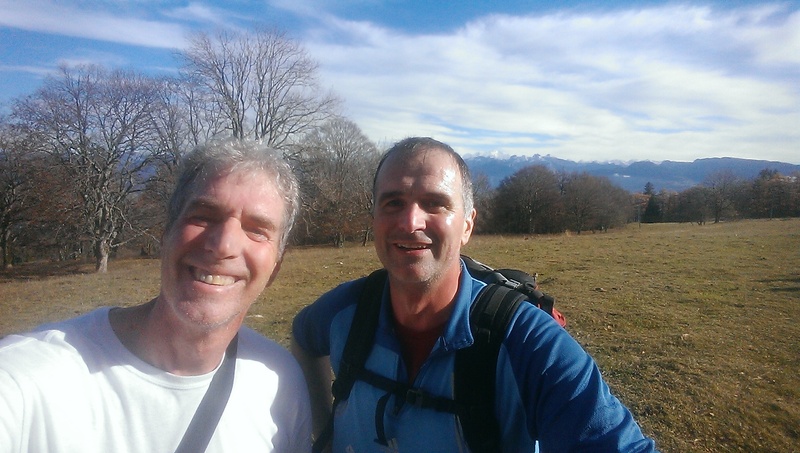 Have I mentioned that I like hiking up Geneva’s local mountain the Salève? I like hiking up the Salève so much that I’ve done it 80 times. Yes, for some obsessive compulsive reason, I’ve kept count. In past posts, like this one, I’ve chronicled my hikes up with various family members and friends. Most of the time, though, I’m alone. And because I’m kind of a friendly Gus, I am always on the lookout for potential hiking companions who are there to hike the mountain at the same time as me. So off we go, and it’s about a 10 minute walk just to get to the trailhead, which gives me plenty of time to size them up as potential hiking companions that day. After we had established that we were all Americans, I asked them where they were from and it turns out they are from a town called Lakeville, just 15 minutes from my hometown of Eagan, Minnesota. We wound up hiking together almost all the way to the top, but they foolishly didn’t follow me all the way to the top where one is afforded the the view south to the Alps and Mont Blanc. Here they are. Kim and her husband Chris. The only problem with these two is they quit about 10 minutes from the top. One time last spring, I encountered two guys who looked confused and in search of the trail head, so once again, I offered them my assistance. Meet Rade and Kanje. 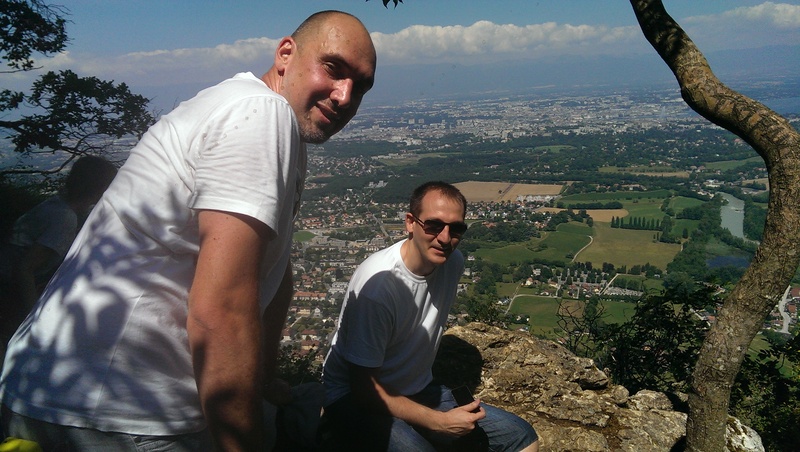 Rade and Kanje enjoying the view! These two are friends and work colleagues from Serbia who were in town for a week as I.T. consultants to the World Health Organization. We met at the bottom and hiked all the way to the top, discussing world events all along the way. I still get emails from Rade telling me how much fun they had that day. Not everyone I encounter on my way up are out to hike the mountain. I came across this nice woman one day who is from the town of Monnetier, at the halfway point of the hike up. She was out on a walk and stopped to feed these donkeys. 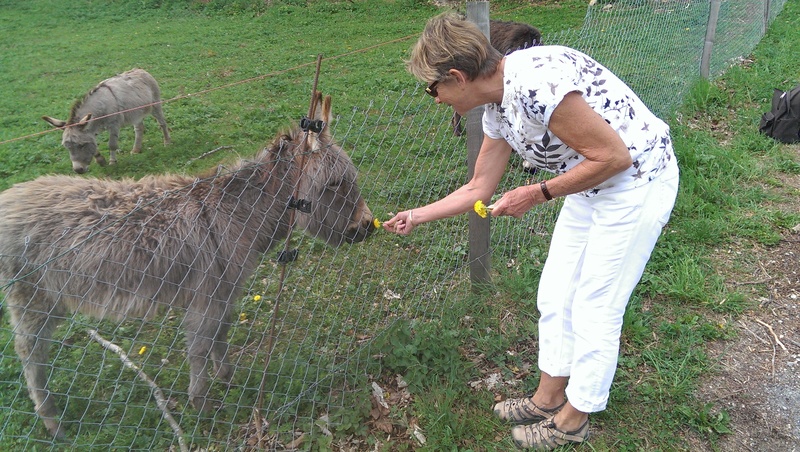 This donkey likes fresh dandelions! He also told me he has planned a hike all the way to the top of Mont Blanc this spring! I met this guy a few months back as I started to pass him when he leaned over to pick up some garbage from the trail. I slowed down long enough to say “thanks” and he said he hikes the mountain all the time and always has a goal to pick up 5 pieces of trash. (The trail is generally pretty clean, but I love the spirit of the idea of finding 5 pieces of trash to pick up as you hike along.) 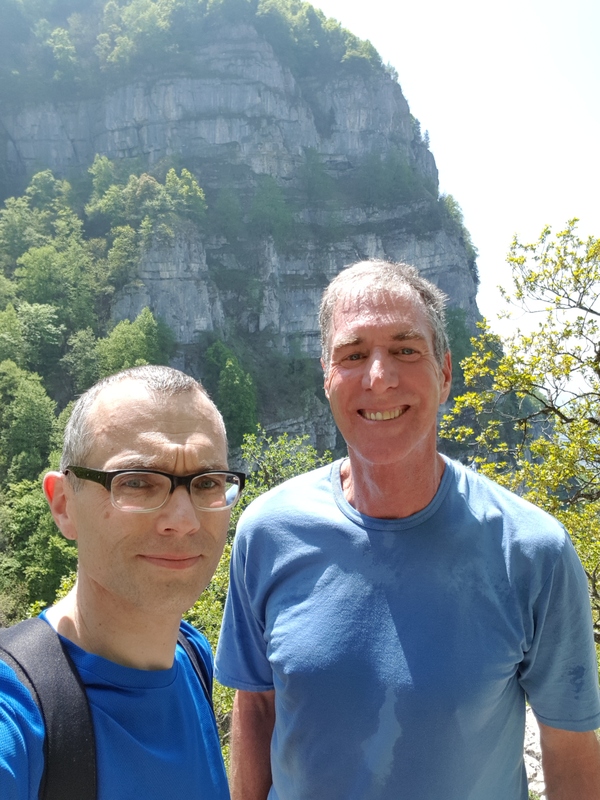 I either can’t remember or never asked him his name in the 30 minutes we hiked together, but I did get to know him well enough to learn that he is a former semi-pro basketball player and he’s been hiking the Salève “almost every weekend for the last 20 years”! 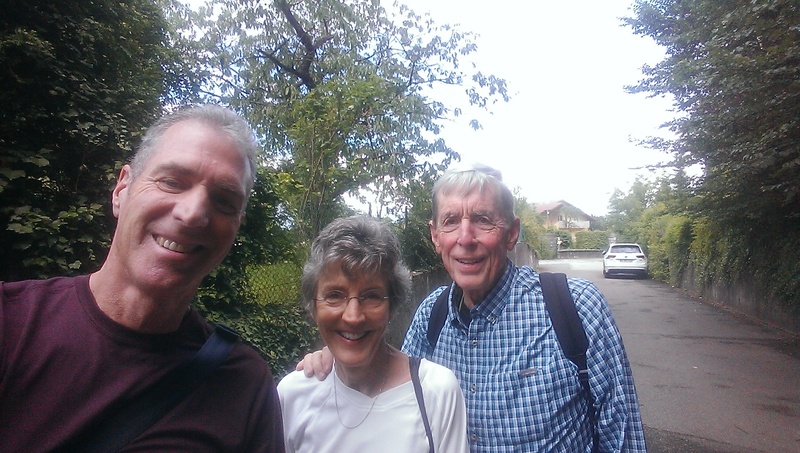 This couple I met on the bus on the way to the Salève, and I saved them from getting off at the wrong stop. We walked together all the way from the bus stop to the foot of the mountain, about a 20 minute walk. I learned that she is a hell of a hiker, once having hiked for 10 days circumnavigating Mont Blanc, which I’m told is the equivalent of climbing Mount Everest twice, in terms of the total altitude gain! These folks were only up for a shorter hike on this day. Here’s another guy I met on the way up once, and I took his picture, but for the life of me, I can’t remember any particular details about him. I can’t remember the details on this guy, but he was a good hiking companion. But the best day of hiking I ever had with someone I met on the way up was this dude, a Polish guy name Micolaj. We’re about an hour in on a 6 hour hike. 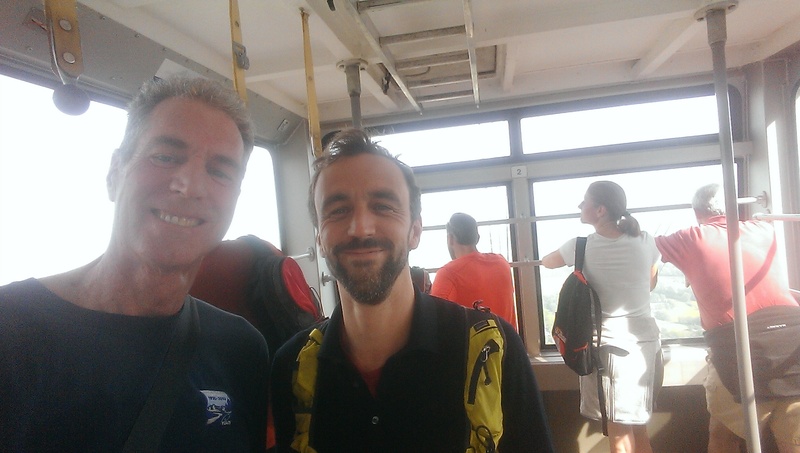 He was asking directions of a local when I caught up to him, so I opened with my standard go-to line: “Are you looking for the trailhead?” and when he responded yes, I said, “then follow me!” Micolah was a public defender in Krakow, a real interesting guy and a solid hiker. On a day where I had planned just to hike up and ride back down on the téléphérique (cable car), Micolah and I wound up taking a long loop hike up and all the way up and back down. We even shared each other’s food. We spent 6 hours that day hiking together! It’s always a little sad at the end of these hikes when I have to say farewell to these kindred spirits. But I know they won’t be the last friends I’ll make on the mountain. Followers of this blog will recall my good friends Philippe and Linda from a previous post on how they make the best ice cream on the planet. When they are not working in Geneva at ArtyGlace making ice cream, Philippe and Linda live in a beautiful, quaint, rural village called Lullin, nestled in the French alps about an hour away from Geneva. Lullin is characterized by the surrounding majestic mountains, sloping fields with grazing cattle, and all the essentials necessary in a small village, but not much more, which is just the way its 800 or so residents like it. A while back, Linda happened to mention that there was an old shed adjacent to the property that had become a bit of a hazard and hinted to me that Philippe might be able to use some help in taking it down. I enthusiastically jumped at the chance to help Philippe with the project for two main reasons. The first is that I really enjoy hanging out with Philippe. We always have plenty to talk about, and as he once succinctly put it, “it’s funny”. The other reason was that I’d get to participate and witness the demolition of a large shed! How great is that? So I drove out to Lullin on a bright Monday morning, and after an hour or so of socializing in his back yard, we went to work. The first step was to empty it’s contents, which included some old doors, a large stack of roofing tiles, a very old wood stove, and two big wagon wheels. Here’s a look at the shed shortly after we began work. 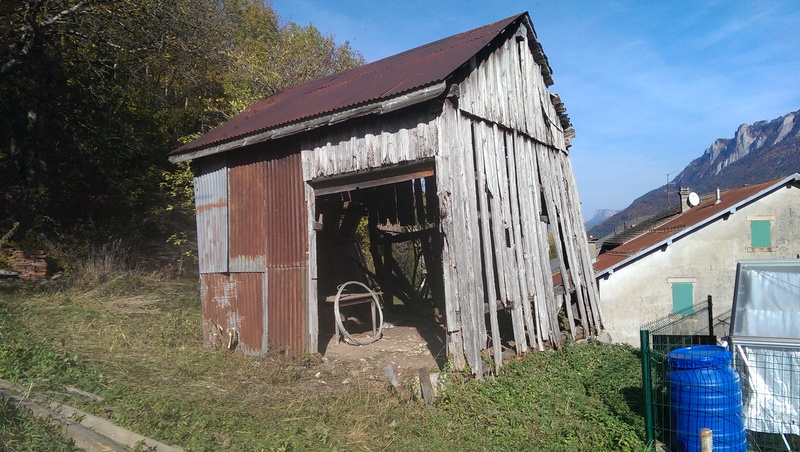 Philippe thinks this shed is 100 years old. The second step in the demolition process was to dismantle and remove as much of the shed as possible. Its an old shed, so using a crow bar, the nails pop out relatively easy. 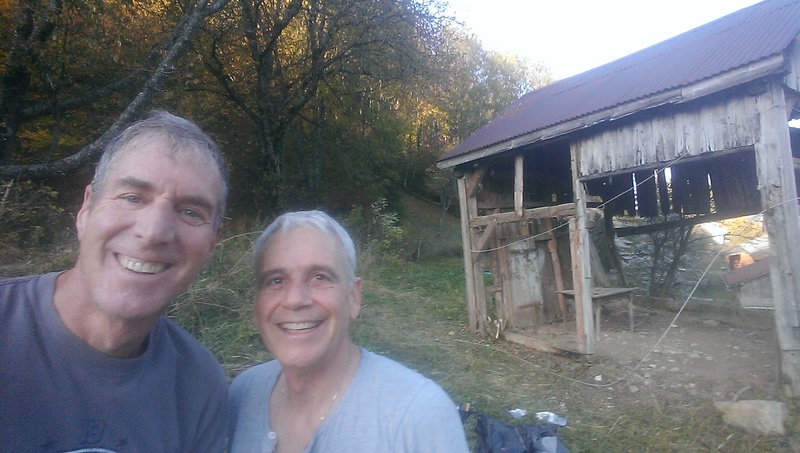 Here’s a picture of Philippe and me after taking apart many of the siding planks. As you can see, the shed is shedding! More on the shed demolition in a moment, but this was a three day project, and since all work and no play makes us dull boys, we did take some time to have a little fun, and also enjoy some of the traditional local fare. In particular, Philippe wanted to turn me on to two specific items, both in the sausage family. We walked down to the local charcuterie, and picked up some boudin for lunch, and some atriaux for dinner. For the uninitiated (like myself), boudin is a sausage made entirely from dried pig blood. Atriaux is made entirely from pig innards. Philippe assured me that if I didn’t like it, he’d make me something else. I told him that that I was sure that wouldn’t be necessary, and that I would absolutely love it… which I did! We also had some time to take a short walk up to visit Philippe’s mom, and on the way back home, Philippe noticed that a friend of his who owns around 40 antique cars was outside his garage. 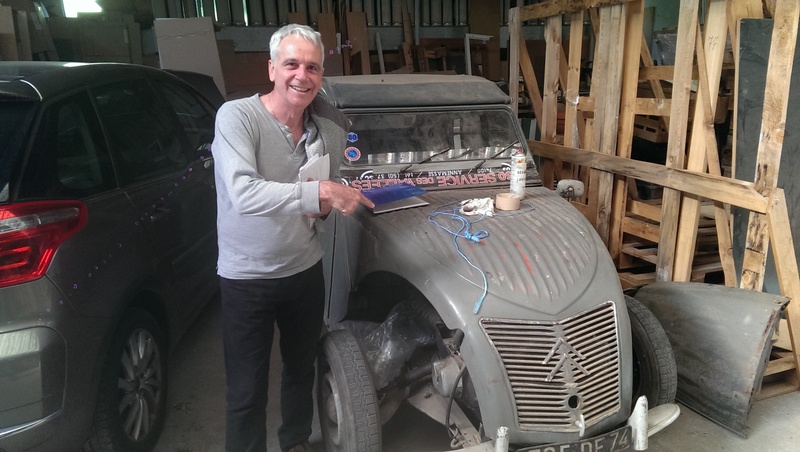 We walked up to say hello (“bonjour”, actually) and after exchanging pleasantries, Philippe said to me, “come here, I want to show you something.” He leads me over to a very old and very dusty car, which I think he said was a Renault. He proceeded to tell me that this very car was his family’s car when he was a little boy! I said, “You mean this actual car?” and he said, “yep”. Philippe told me that when he was just a little boy he got a nasty cut on his upper lip when his father stopped suddenly, and he flew forward into the front seat frame. They hadn’t yet invented seat belts, and the seats were literally made with a steel tubing frame and basically just screwed in to the floorboard. Automobile safety has come along way since this car rolled off the assembly line! Okay, back to our work demolishing the shed. The third step in the process is to loop a strong wire cable two times around the shed. You can see the cable if you look closely (or click on it) at the photo of Philippe and me above. Philippe’s friend and neighbor Yves provided the cable, and also the tractor which supplied the horsepower necessary to pull down the shed. Do you want to see what that looked like? Of course you do! 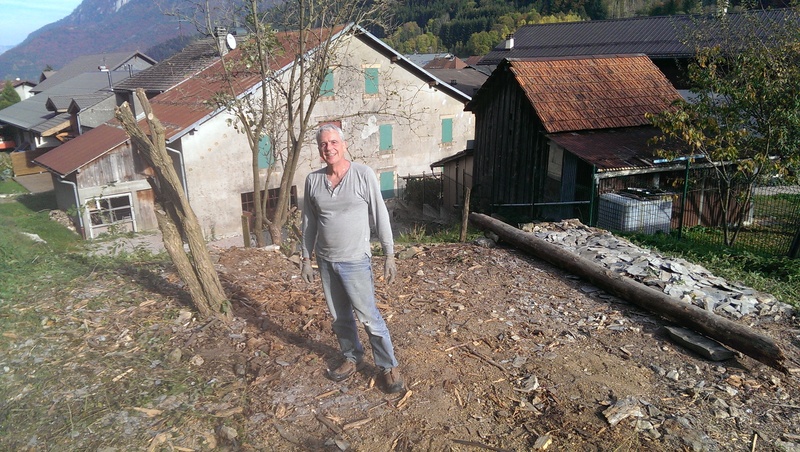 Pulling the shed down wasn’t quite enough to satisfy our desire for total destruction, so we asked Yves to knock it down a bit more, as long as we had a big tractor at our disposal. This part isn’t as exciting as the previous video, but it’s still pretty fun. Throughout this whole process of course, we needed to find a place to deposit all the lumber, roofing panels, and other miscellaneous construction materials. Fortunately, there was a very convenient nearby spot to store it all. 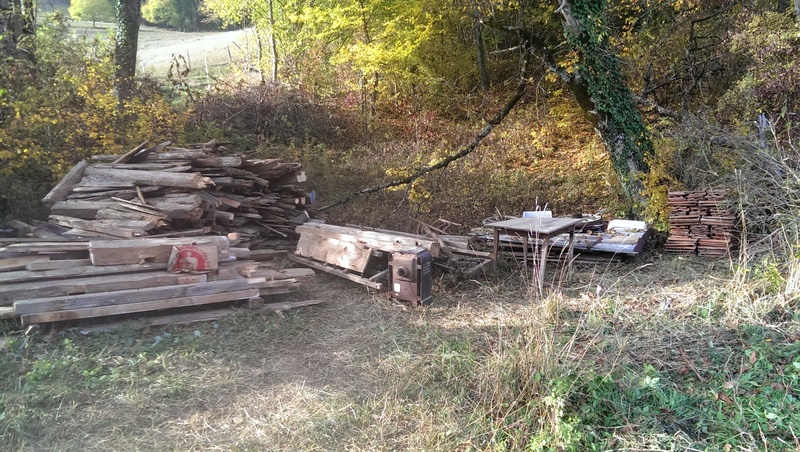 To be honest, I’m not sure what the long range plan is for all of this stuff, although Philippe did talk about someday using some of the salvageable lumber to build a storage area for firewood and other items. I did notice, though, that Philippe is not the only person who is storing piles of old lumber or other old building materials on their property, so it seems as though the practice is socially acceptable in this part of the world. And it’s not as though there is no place to put it. Lullin is a rural village and there’s plenty of open space around. Besides, we stacked it in very neat piles, as you can see from the photo below. Here’s what a 100 year old shed looks like all stacked up. On Wednesday, two days after we began, we completed the job. Philippe confessed to me that at first, he was unsure that we’d be able to get it finished, but we discovered that the two of us work pretty well together, and that combination along with a little bit of horsepower and assistance from Yves and his tractor was enough to successfully complete the job. I’ve had lots of fun during these last 4+ years living in Switzerland, but spending these days in Lullin working with Philippe to take down this shed will definitely be one of my most enjoyable memories that I take back home with me when this whole adventure is said and done. Philippe standing where the shed once stood. Greg was here to hike for a week. It’s Game On! My friend Greg came for a visit, and he came with just one objective. To better the record of my other friend Pat M. who was here a couple months back and hiked about 50 miles with me on his 6 day visit. 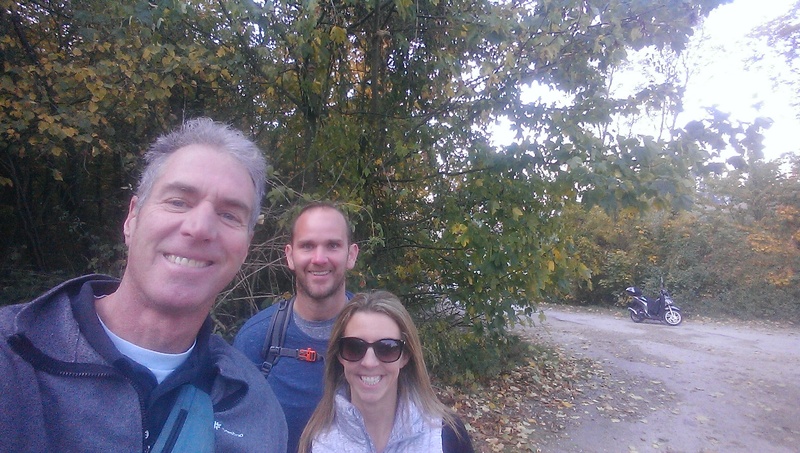 Greg told me that he had been training for this week by hiking up and down stairs near his house along the nearby Mississippi River, which is the closest thing they’ve got to the Swiss alps. Think you can find a more beautiful country than this?? Norway, José!! What’s the best place to watch a French victory in the World Cup? A French bar!